Would love it if at some point you wrote a few things about Conan: Born on the Battlefield…the writing process, the goals you wanted to achieve and how you went about achieving them! For me Born on the Battlefield is like a Terrence Malick film, difference being that unlike Malick nature offers no sanctuary to the characters. Also I’m loving your Facebook page, thanks! My pleasure. Anyone who hasn’t checked it out can find me on Facebook at The Official Kurt Busiek Page. As for Born on the Battlefield…I’m not sure what to say. We set out to do two things, really. First was to tell the story of Conan’s youth, based on the various hints and snippets and references made by Robert E. Howard in both his Conan stories and his letters. We dug up all the information we could—from the information that he was in fact born on a battlefield to things like his father being a blacksmith, his grandfather telling stories of raiding into the civilized lands in his youth, the bit about breaking a bull’s neck with his bare hands and so on—and tried to shape it into a set of stories that would show Conan growing into the person we meet in “The Frost-Giant’s Daughter,” a wanderer driven to see new things, unable to stay in one place, distrusting of authority but strong enough to lead, smart but moody, someone with so primal a core he stood out even among his own people and so on. The second thing was that we wanted to use the arc as a way to save Cary Nord some schedule time. So it was done as a series of single-issue stories (except for the two-part finale), to be dropped in in-between the main story arcs. A way of doing fill-ins that wouldn’t feel like fill-ins, but as an event readers could look forward to. It was a little tricky, sometimes, to write it so that it’d work as standalone issues and still read well when collected into book form, but it was worth it. Readers liked it, and it’s gotten equally good reaction in book form. Howard never really showed us Cimmeria, so building it from his references was fun, making it a relatively cheerless, almost Calvinistic place, full of grim purpose and unending work, building a culture that was primitive enough to be considered barbaric but developed enough to have blacksmiths, and so on. And Greg Ruth did an amazing job with the artwork. I think I drove him crazy sometimes with nitpicks obsessions about swords and terrain and kilts. But he really made it all come to life beautifully. I understand a lot of writers don’t like to comment on writer’s block, but I know that it is a real problem sometimes. When you have a deadline, and have yet to nail something down, what do you do to get yourself inspired to write? Who would be some of your dream actors for Astro City the movie? Since I’m a producer on the Astro City movie, currently in development (knock wood), I’ll hold off on revealing my top choices, because I wouldn’t want to deal with people saying later, “You wanted Hartley Thrushlocks for that role and had to settle for Craigston Hardwick! Why don’t you like Hardwick?” when ol’ Craigston is in fact perfectly good for the role. As for writer’s block, I’m not sure I’ve ever had it. There are times I find it hard to get going, but that’s usually physical—fatigue, allergies, sinus infections, whatever. So deal with the physical stuff and let the brain work. Or if I’m having a hard time making a story work, I’ll talk to my wife or call a friend and bat it around. I often find that just explaining the story to someone else lets me solve the problems I’m having, that my brain’s chasing things round and round fruitlessly, by forcing myself to articulate the problems out loud brings along the solution pretty easily. Karl Kesel occasionally mocks me for calling him up for story help, explaining the problem and figuring out the solution without him having to say anything more than, “Uh-huh. Uh-huh. That sounds good.” But I wouldn’t get to the solution without the process of talking to him. Whatever works. 88 page graphic novel like (example movie 300). I’m deleting the identifying info because I’m not posting this in order to hold this person up to criticism, just using this as an opportunity to publicly respond to this kind of query, which I get every now and then. The thing is, I’m not actually looking for work, and when I am I’m not just looking for someone to meet my rates, and will produce origin stories and graphic novels like yard goods. I’m plenty busy, and when and if I am looking for assignments, I’m going to seek them out from established publishers. Writing for a living isn’t just about getting paid a certain amount—everyone who writes for the public wants the material to reach an audience and be presented well, so we want to know that just as we bring talent, craft and creativity to the table, the publisher brings the ability to do their side of the job well, too. Can they produce a well-made book, promote it well, get it distributed to stores, and more? Will they be able to team me up with good collaborators for the art, the lettering and so on? Are they well-established enough that I can be confident they’ll pay their bills, and pay royalties on a steady schedule? I’m also forced to wonder: If other creators are going to be writing, penciling, inking, coloring and lettering the comic, what’s left? In any case, no offense is meant to the person who e-mailed. I’m just not available on that kind of basis. Are DC and yourself still going to follow up on the end of Trinity? Is there any timeframe if yes? As I understand it, you’ve already seen a follow-up, though I’m not entirely sure which one. At one point, the “Earth-One” created at the end of Trinity was going to be the setting of the DCU Online roleplaying game, in which case the follow-up is the DC Universe Online Legends series that Marv Wolfman and Tony Bedard are writing. Of course, it’s possible that plans changed, and the Earth-One you saw at the end of Trinity is the setting for J. Michael Straczynski’s Superman: Earth-One graphic novel. Or maybe it’s something else. But when I finished Trinity, it wasn’t with the idea that I’d be following up that thread—it was put in at DC’s request, so they could take things onward as they chose. So it’s entirely up to them. It would be nice to see someone pick up the Dreambound or Tomorrow Woman or Warhound and do something with them, but since I’m currently not writing anything set in the DCU, it won’t be me, at least not at present. Maybe someday. Thanks again for creating the best comic books that have ever existed. My pleasure, Dan, and it’s Brent’s, Alex’s and the rest of the team’s, as well. We’re delighted you like it so much. I don’t think I’ve ever written to you before, but I just wanted to stop buy and saying thank you for Thunderbolts. It’s my favourite comic ever published, and owes everything to your idea and groundwork. In fact, it was the comic that got me into comics in the first place, which is a hobby I have loved (and still do) for 10+ years. I know it must be odd, getting a message like this after so long, but it occurred to me I have never expressed to your how much enjoyment and pleasure I have gotten from Thunderbolts. I truly hope it gets made into a film (trilogy) one day. Your work deserves it! I don’t have much to say in response but thanks—it’s great getting mail like this, but hard to respond to. 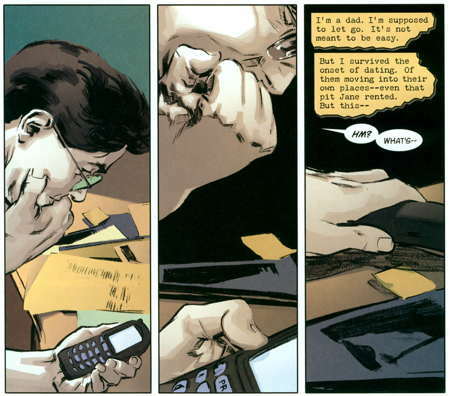 On page 188 of the trade paperback of Superman: Secret Identity (this would be in the 4th issue) Clark is contemplating what to do with his two daughters when he notices a Post-It by the phone. I was just wondering what was written on that Post-It or what the significance of that note was. I know it’s been a while since Superman: Secret Identity was finished and released but this has been something that’s really been at the back of head for quite some time now. Still waiting for the possibility of a Shockrockets Vol. 2 and even Superstar. 🙂 Thanks so much. I didn’t remember a Post-It in the story, so I had to go check. No, there’s nothing important on that Post-It (or at least, not important to the story; it may well be important to Clark. It’s just part of the general clutter of his office. What he’s reacting to is the sound of the train derailing, as he notes on the next page. Sorry that was confusing! And more Shockrockets or Superstar would be nice, someday. In the meantime, I’m just happy both are back in print and available for new readers to try ’em out! 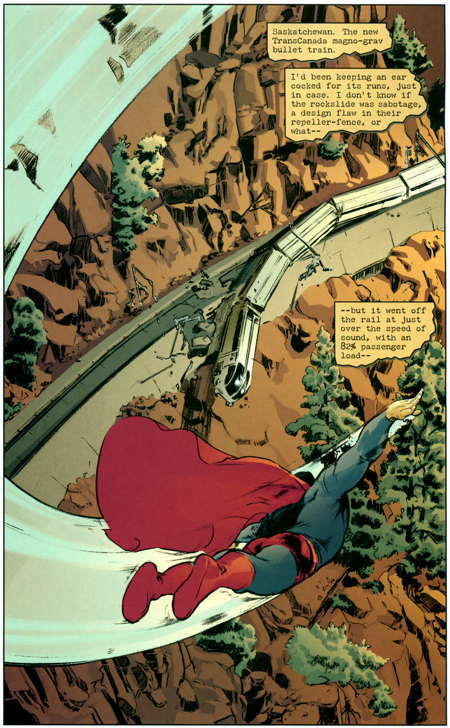 I just finished reading all 4 Superman: Secret Identitys and I just wanted to say it’s a piece that really spoke to me. It just made me feel better about my own life. A lot of the things Clark dealt with I could absolutely relate to, I think a few times my thoughts matched his on the page. The books just left me with a very good feeling about life in general, and that for the first time in a long time I’m looking forward to what’s down the road for me. I’m ready to live my life and have my own adventure. Thank you again for your wonderful work. You keep writing them, I’ll keep reading them. It’s a deal. Thanks for the note. Is Astro City ever gonna come back out? Yes, it is. We’ve been working on it steadily, but haven’t firmly scheduled its return yet, because (a) there’ve been a couple of waves of business upheaval that delayed things, and (b) we want to make sure both Astro City and the new book, The Witchlands, will be on a monthly schedule when we do return, something we haven’t exactly been great at the last few, uh, forever. So we want to make sure everything’s going to work smoothly and stay working smoothly, rather than come back with promises of being monthly and then immediately fall off the rails. But we should be ready to make an announcement fairly soon. And that’s another batch of mail answered! I just finished a difficult script, so let me catch up on some e-mail that’s stacked up. Sorry if you get asked this a lot, but I had a look on your website and I couldn’t find the answer. 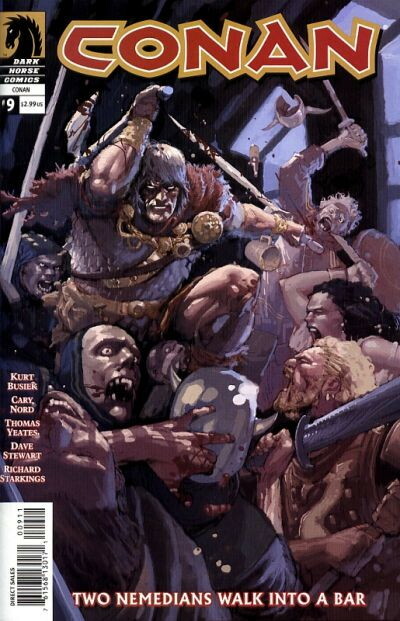 My question is, will you be writing any more Conan tales for Dark Horse? And if so, will Cary Nord return to do the artwork? I certainly hope so! Glad you liked our tenure on Conan, sir. There’s at least one more Conan project I’d like to do. When we started out, all that framing-sequence business with the Prince and the Wazir was setting something up, a big end-of-epic story we thought of as “Conan the Legend.” And at times, we’ve talked about doing a big mini-series called (wait for it) Conan the Legend to wrap it all up. So it’s certainly possible. If and when it happens, I sure hope Cary will be available, along with Dave Stewart and Richard Starkings, so we can do it with the original team. No, you didn’t miss Eye of the Camera #6. The good news is, we’re only waiting on three more pages of art before it can go off to the printer and become a reality. The pages we do have are being lettered and colored, so once those last few come in, the fine folks at Marvel can turn it around fast and get it off to press. So it looks like we’re almost there. And thanks for the kind words on Avengers. I was just writing to thank you for your column “Breaking in Without Rules.” That was equal parts depressing and enlightening. I really appreciate your frankness, everyone else I’ve read seems more interested in sugar coating things. Really it was like Steven King’s On Writing for comic books. I haven’t read much else of what you’ve written on the site yet but a friend passed me the link to your article and he was right I think I really needed to read it. After running submissions for over a year to various indy companies it was very enlightening. I don’t know if reading it will get me close to being published or even if it really points me in the right direction but at least I know not to just spin my wheels aimlessly watching the mail box so I’m really glad you decided to write it all the same. Also I love Marvels (I’m sure you get that a lot) and I’m an on again, off again fan of Astro City. I kind of felt like Astro City is the modern version of Wild Cards (yes, I know they started that up again lately but the books are not the same as they once were) and I really enjoyed your run on GL in Wednesday Comics (which my friends liked to call the hot sheets). I haven’t read much of your other work but after reading your article I’ll be keeping my eye out for your name on things. With the amount of mediocrity in comics right now it seems like you get a lot more bang for your buck to follow writers these days instead of characters. Good luck in your future endeavors, thanks again for putting “Breaking in Without Rules” online and keep up the good work. Thanks, Nick. I’ll do my best. And good luck with your writing endeavors. I can’t wait to see the Wednesday Comics collection, myself—just seeing a photo of it here makes me all itchy to have one myself. And I’m told that a fresh-from-the-printer copy of The Wizard’s Tale is on the way to me and should arrive Tuesday. I’ll have to figure out my iPhone’s camera, so I can put some pictures of it up here. But for now, back to work. Will you be attending SDCC this month? If so, will you be doing any signings? I will only be attending on Friday but hope you might make an appearance that day. You can always see my upcoming con appearances and such by checking Find over on the left to see where I’ll be. I will indeed be at the San Diego Con, Friday and Saturday at least. My schedule’s listed there, but I’ll put it up in a blog post as well. I just wanted to point out that on your awards page you left out the Eisner for Best Single that Conan #0 won, or rather shared with an issue of The Goon, in 2004. Really happy you finally have a website like this. Am looking forward to the announcements of your new projects. Thanks, Paul. Fixed that award entry; much appreciated. So glad to see you’ve got a website! Friends introduced me to Astro City a couple of years ago and I’ve been enjoying it muchly. Also, I thought ‘Secret Identity’ was one of the best things I read last year. P.S. Would love to see how you write comic scripts! I don’t normally write these things, and you probably don’t read each of these silly fan letters. However, I felt compelled after reading your work on Marvels: Eye of the Camera (I just finished issue 5) to tell you directly (sort-of) that it is without a doubt the most beautiful and touching this I’ve read all year. Thank you for returning to Phil Sheldon. Your portrayal of Phil’s decline is heartbreaking and heartwarming at the same time. When I was younger and read Marvels for the first time I was captivated, and I wondered what could happen next; what would Phil Sheldon think of the “marvels” as the stories told during the eighties and nineties unfolded? Thank you for addressing that, and thank you for making it so human. Very glad you’ve liked it, Crow! And on that note, I’ll mention that Marvels: Eye of the Camera #6 is still progressing—and as soon as it’s all drawn, I’m sure Marvel will have the issue and the subsequent collections out post-haste. I’d have preferred it if they’d waited until all six issues could come out on time, but for one reason or another, they chose to get the first five out when they did and the sixth when it’s done. I do have to say, if there was going to be a delay between any two issues of Eye of the Camera, between #5 and #6 is the best spot for it. So I’m glad of that, at least.